Our first Cicilux Vendor interview is with the creative designer behind Truffi, Veronica Halim. Veronica introduces us to the mindfully artistic design process that brings to life an oriental themed invitation suite. Be inspired by a contemporary style that mixes delicately with Asian traditions. Cicilux: What is your approach, and philosophy, to making traditional elements look contemporary and creative? Veronica: I feel that to be able to produce something new and creative, you can't be afraid to mix and match things. I often look for material around me that doesn't have any connection to the things that I do. I find inspiration from the places I visit, ceilings, tiles, art, fashion...but most of all, I always find inspiration from culture, heritage and the love story of the couple. Veronica injects many traditional, oriental elements into a modern invitation design. 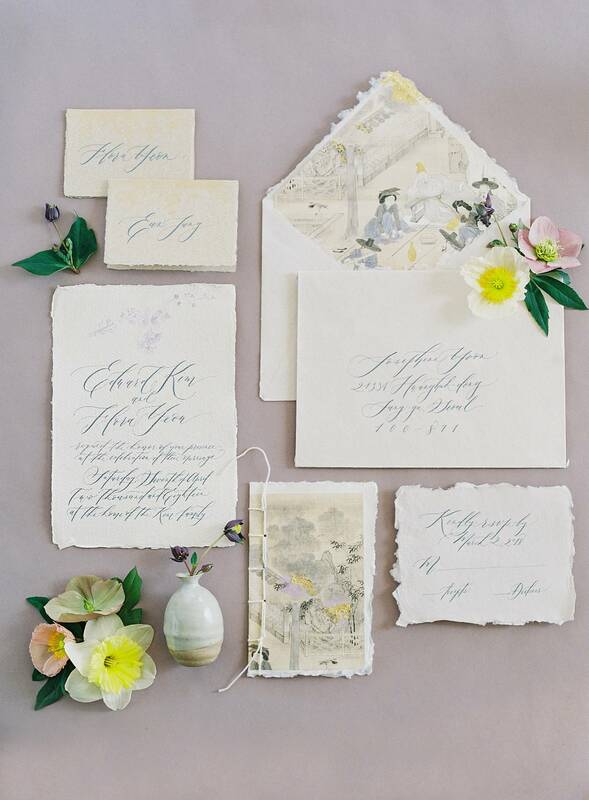 "In the recent styled shoot with Joy Proctor for Tulipina's Korean Workshop, I used the combination of traditional ink painting and traditional book binding as one of the unique details in the paper items, combined with modern, handmade paper." Traditional ink painting involves the same techniques as calligraphy and is done with a brush dipped in black ink or coloured pigments. Veronica's designs use one of the techniques of traditional painting, called "Gong bi", which means "meticulous". Gong bi uses highly detailed brushstrokes that delimit details very precisely. It is often highly coloured and usually depicts figural or narrative subjects, which we think is the perfect element for invitation envelopes and Order of The Day cards. Cicilux: What are the dos and don'ts when designing Asian wedding invitations? Veronica: We need to know the finer details when designing invitations for Asian weddings. This means we need to know the structure of the invitation content and whether the parents' names are listed before the names of the couple. Colors also play an important role in some of the more traditional Asian weddings. We seldom get to design black invitations or white on white invitations. There is nothing quite like the traditional touch of an elegant gold foil print. If you are after an invitation suite that incorporates tradition along with a contemporary design, then you can include a gold foil design or scripted font into your invitation suite and partner this with colors that appropriately match your wedding theme. 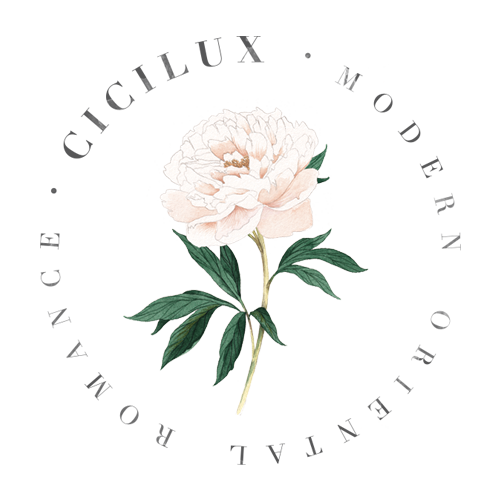 Cicilux: What are the "thinking outside of the box" iconic themes that represent Asian heritage, besides common motifs like the Peony and Phoenix? Veronica: We try to dig deeper than the commonly used Peony or Phoenix, finding inspiration from old poetry and folklore tales. In the case of a Japanese theme, we can explore a unique Haiku, the Hyakunin Isshu: 100 poems by 100 poets, symbols and motifs from traditional fabric, etc. There will always be requests for a peony motif as it is so popular, but this doesn't mean that we can't create something unique. We simply combine an iconic pattern with something new and fresh. Veronica often embraces delicate native flowers to bring her traditional invitation creations to life. In the pictures on the left and below, the feminine characteristics of the Sakura in spring contrast effortlessly with the masculine waves in the invitation design. The crane is a majestic bird that is a popular subject in many Asian paintings. It is a symbol of luck, longevity and fidelity. In Japanese culture, the crane is called 'Tsuru'. They are monogamous, so frequently used in wedding decor. For example, beautiful images of tsuru are often embroidered on formal wedding kimonos and the uchikake, a decorative kimono that is worn over the wedding kimono. 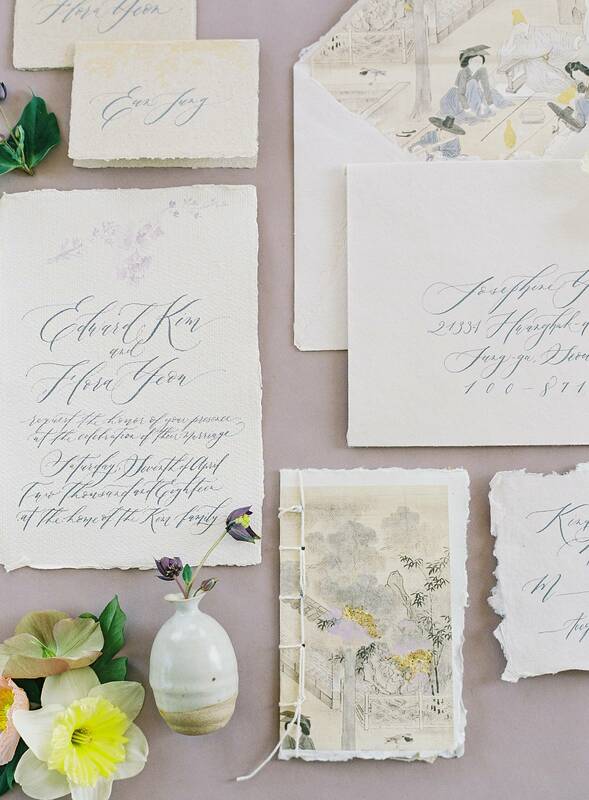 To add a personalised touch to your invitation suite, include words from your favourite love poems. These meaningful words work wonderfully as a background to your Save The Date or Reply cards and bring an extra bespoke appeal. Veronica Halim is an international calligrapher known for the expressive yet graphic quality of her penmanship. Formally trained in graphic design with a successful career as a brand Creative Director, Veronica's work has been internationally recognized with frequent commissions from prestigious brands such as Chanel, BMW, Gucci, Penhaligon and TWG. She is the author of Calligraphy Styling and holds regular workshops in Japan, Singapore and Jakarta.